Introducing Applied Linguistics provides in-depth coverage of key areas in the subject, as well as introducing the essential study skills needed for academic success in the field. • is organised into two Sections: the first introducing Key Concepts in Applied Linguistics; and the second devoted to the Study Skills students need to succeed. 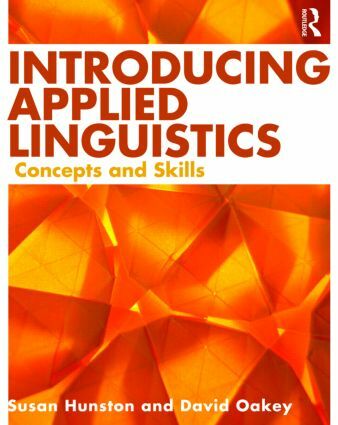 • features specially commissioned chapters from key authorities who address core areas of Applied Linguistics, including both traditional and more cutting edge topics, such as: grammar, vocabulary, language in the media, forensic linguistics, and much more. • contains a study skills section offering guidance on a range of skills, such as: how to structure and organise an essay, the conventions of referencing, how to design research projects, plus many more. • is supported by a lively Companion Website, which includes interactive exercises, information about the contributors and why they’ve written the book, and annotated weblinks to help facilitate further independent learning. Ideal for advanced undergraduate and postgraduate students of Applied Linguistics and TEFL/TESOL, Introducing Applied Linguistics not only presents selected key concepts in depth, but also initiates the student into the discourse of Applied Linguistics. Susan Hunston is Professor of English Language and Head of the School of English, Drama, and American & Canadian Studies, at the University of Birmingham, UK. David Oakey is an Assistant Professor in the Applied Linguistics Program at Iowa State University, USA. Contributing authors: Svenja Adolphs, Aileen Bloomer, Zoltán Dörnyei, Adrian Holliday, Alison Johnson, Chris Kennedy, Almut Koester, Ruby Macksoud, Kirsten Malmkjaer, Kieran O’Halloran, David Oakey. Juup Stelma, Joan Swann, Geoff Thompson, Dave Willis, Jane Willis and David Woolls.